How Lucy Died – and why it matters. 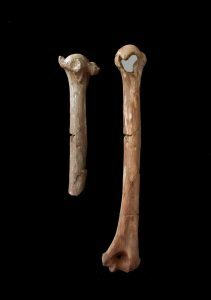 On the left, Lucy’s right humerus in discovery state. On the right, Lucy’s reconstructed right humerus. Posterior view of both. Team Lucy began its detailed study of Lucy in 2008 when the world’s most famous fossil was in the United States as the centerpiece of the museum exhibit, “Lucy’s Legacy: The Hidden Treasures of Ethiopia,” hosted by the Houston Museum of Natural Science. During the course of her nationwide museum tour, Lucy secretly detoured to the University of Texas so that Team Lucy could use their hi res CT scanner to X-ray the entire skeleton for the very first time, and then use these data for their studies. Although Lucy is remarkable in the degree of representation of her skeleton, she is also typical in that the majority of her bones preserve postmortem (“after death”) damage caused by taphonomic and geologic processes that naturally fracture vertebrate fossils after the individual dies and until the bones erode out of the sediments and are discovered. However, Team Lucy’s close inspection of the skeleton identified a small subset of fractures that appear to represent high-energy compressive bone-to-bone fractures with tiny fragments of bone preserved in place at the breaks; these fractures are interpreted to have occurred perimortem (“near time of death”). Interestingly, this subset of fractures shows close consistency with those seen in people who have suffered an impact following a fall from height. Because Lucy’s skeleton appears to have experienced minimal transport, and the area where she was found was a flat part of a floodplain, Team Lucy suggested that the most likely way for this high energy impact to have been produced would be if she fell out of a tree. It is therefore ironic that the fossil that has been at the center of a vigorous debate about the role, if any, of arboreal locomotion in early human evolution can potentially be attributed to a fall out of a tree. The Ethiopian Ministry that provided permission to Team Lucy for its study has also released 3D stl files of the skeletal elements of the right shoulder and left knee so that anyone anywhere can download these files, print them out in 3D, articulate the elements, and thoroughly and completely evaluate their hypothesis of her death. These files are available here. This is the first time that any of Ethiopia’s rich record for human evolution has been made available on the web, and it is exciting that Lucy is leading the effort for open data sharing. For more details, read the full article at Nature.com.